Does your Keratoconus prevent you from living a full life? Besides the double vision, halos and generally poor vision, do you suffer from dry eyes, itchy eyes, bloodshot eyes, eye fatigue, headaches, inability to wear your contacts for longer than a few hours, or the inability to drive at night? Whether Keratoconus is a new diagnosis for you, or you have been wrestling with it for decades, there is a solution to the poor vision and constant annoyances that Keratoconus causes. Get The Keratoconus Ebook Today, Free! Dr. Barry Leonard is a nationally known expert on Keratoconus. He lectures on Keratoconus and trains other optometrists on its treatment. 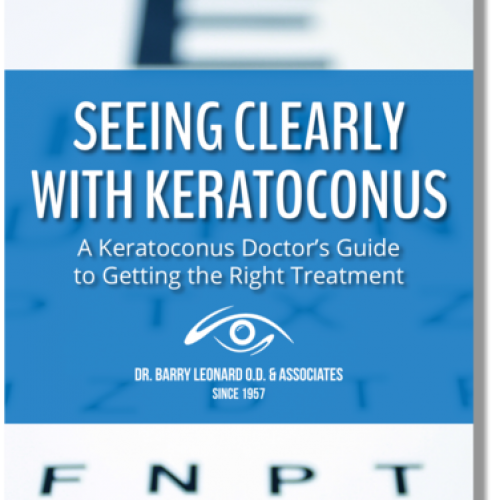 And now Dr. Leonard has written an ebook just for Keratoconus suffers like you. You will discover what Keratoconus is, why some treatments usually fail, and how to finally see clearly with Keratoconus! Enter your name and email address and get it today! Patients fly in from all over the USA to be treated by Dr. Barry Leonard. But if you are in Southern California, better eyesight is just a short drive away. Call Dr. Leonard at 818-891-6711 to make an appointment today, or make an appointment online. Either way, once you see Dr. Leonard, you won’t believe how much better your vision — and your whole life — can be!